She likes me so, so do I." When Dore Schary took over the reins at MGM in 1951, he began to systematically change the studio's focus. The musicals and heartwarming family pictures that so beguiled his predecessor, Louis B. Mayer, didn't interest the serious-minded Schary, who sought to mount more realistic and socially conscious dramas under the Metro flag. Schary was wise enough not to shun musicals altogether�after all, they were MGM's bread-and-butter for years�but he did severely curtail their production in favor of such "message" films as The Red Badge of Courage, Bad Day at Black Rock, and The Blackboard Jungle. Few, if any, musicals were weighty enough to satisfy Schary, but he must have been pleased with It's Always Fair Weather. Substantive, cynical, and even slightly depressing, this Betty Comden-Adolph Green original enjoys many fine moments, but can't come close to recapturing the magic of the team's most famous efforts�On the Town, Singin' in the Rain, and The Band Wagon. Exuberance and joy define those films, but such moments come at a premium in It's Always Fair Weather, thanks to its darker, more sarcastic tone. And get this: Gene Kelly and Cyd Charisse star in the movie, but astoundingly never dance together on screen! Kelly tears it up with cohorts Dan Dailey and Michael Kidd, but doesn't even give Charisse a half-hearted twirl. That's not only inconceivable, it's unforgivable. Time and television are the villains of the piece, and they seek to sabotage the relationship of three Army buddies who served together in World War II. After the jubilation of VE Day, the tight-knit trio agrees to meet again a decade later in the same neighborhood dive they frequented before the war. Ten years can be an eternity, and when Ted Riley (Kelly), Doug Hallerton (Dailey), and Angie Valentine (Kidd) reunite, they find they no longer have anything in common...and can't even bear to be around each other. Savvy TV exec Jackie Leighton (Charisse) gets wind of their situation and decides to exploit it on the weekly show of temperamental diva Madeline Bradville (Dolores Gray), an Oprah Winfrey-Dinah Shore hybrid whose Midnight With Madeline specializes in weepy, inspirational reality TV (in between self-indulgent musical numbers). Patching up the friendship of three estranged servicemen is right up the show's alley, yet in television's best underhanded, cold-hearted tradition, it's all engineered as a surprise. To properly pull it off, a beleaguered Jackie must go to extreme lengths to keep the guys together and oblivious until air time. Of course, the deception becomes doubly dicey when she finds herself falling in love with Ted. The reality TV angle fits snugly into today's culture, keeping It's Always Fair Weather fresh and topical, but it can't salvage the movie's plodding story. Comden and Green are masters of satire, and they're at their best incisively skewering the plastic personalities and manipulative content that pervaded 1950s television, but they have trouble maintaining narrative flow. Although Dailey and Kidd are energetic and engaging, we don't develop an affinity with their characters, and the tepid romance between Kelly and Charisse seems mechanical. None of their sexual fireworks from Singin' in the Rain or passionate longing from Brigadoon find their way into this film, which strangely leaves us emotionally bereft. Of course, the atmosphere perks up during the musical numbers, but hardly any of the catchy tunes relate to the plot. Three, however, are bona fide showstoppers, so we forgive them for bringing the sputtering story to a halt. The Binge Dance begins as a bit of inebriated fun, but soon evolves into a rigorous display of athletic terpsichore that reaches its peak when Kelly, Dailey, and Kidd dance with metal trash can lids attached to their feet. I Like Myself�the film's signature number�is an exhilarating showcase for Kelly, who croons the lilting Andr� Previn melody on roller skates while gliding, tapping, spinning, and leaping along the sidewalks of New York. That tour de force is followed in short order by the dazzlingly inventive Thanks a Lot, but No Thanks, in which an alluring Gray efficiently jettisons a band of dancing suitors with gunfire, dynamite, and trap doors. Blessed with a rich, powerful set of pipes, Gray (in an auspicious film debut) makes a big impression, but appeared in only three more pictures before abandoning Hollywood for the nightclub and Broadway stage. The public's increasing indifference toward original film musicals undoubtedly hastened Gray's departure, and It's Always Fair Weather, despite a valiant effort, did nothing to reverse the genre's downward trend. Still, from such an illustrious cast and crew, one expects more than the film delivers. It's Always Fair Weather is often pleasant and occasionally inspired, but remains too stilted and self-conscious to be thoroughly captivating. And while I appreciate the effort and intentions of those involved, my feelings regarding the movie echo the lyrics sung by Gray: Thanks a lot, but no thanks. Image Transfer Review: By 1955, three-strip Technicolor was a thing of the past, so It's Always Fair Weather lacks the intense hues and crisp delineation of older MGM musicals. Warner, however, does its best to make the film look as vibrant and lush as possible, and admirably succeeds. The widescreen anamorphic transfer benefits from marvelous clarity, fine black levels, and solid shadow detail. Fleshtones remain stable and natural, and colorful accents, such as lipstick, punch up the visuals and offset the flatness that's such a staple of single-strip color. A few errant specks and marks litter the image, but for the most part, any annoying print defects have been removed. Few musicals use CinemaScope as well as It's Always Fair Weather, so preserving its original aspect ratio is vital to the film's success. Co-directors Kelly and Stanley Donen use every inch of the screen during the musical numbers, especially when Kelly, Dailey, and Kidd perform together. Panning and scanning is thus impossible without cutting someone out of the frame entirely and diminishing the impact of many key scenes. Thankfully, Warner presents the film in all its widescreen glory, which is a real treat for anyone who has suffered through a television viewing on any network other than TCM. Audio Transfer Review: Warner has remastered the original soundtrack to DD 5.1; the results won't blow you away, but the audio enjoys wonderful fidelity. Any separation is difficult to detect, but a subtle surround feel helps immerse us in the film. The music sounds rich and full, and dialogue is always easy to understand. Extras Review: A satisfying helping of extras enhances the disc, beginning with the top-flight featurette, It's Always Fair Weather: Going Out on a High Note, which provides an in-depth chronicle of the film's turbulent production history. Though the atmosphere looks sunny on the film's surface, backstage storm clouds threatened to sabotage the musical. Co-directors Kelly and Donen openly clashed on the set (leading Donen to term the experience "a 100-percent nightmare"), and the acrimony�fueled by Kelly's megalomania�reached such an intense degree, their relationship never recovered. 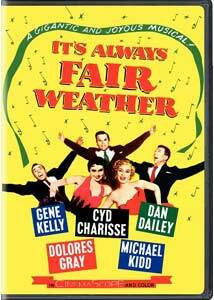 We also learn It's Always Fair Weather was originally envisioned as a sequel to On the Town, and that despite favorable reviews, the film did only lukewarm business. The 16-minute piece includes archival interviews with Charisse, Kidd, and writers Betty Comden and Adolph Green (who discuss the film's "darker tone" and how it examined the "corrosive effect of time on friendship"), as well as perspective and anecdotes from contemporary historians. Two segments from The MGM Parade, a weekly 1950s TV show that promoted the studio's upcoming releases and saluted its older classics, features host George Murphy chatting up the film with Charisse outside her dressing room, and making an "impromptu" visit to the set, where Kelly, Charisse, and company are rehearsing. The first clip showcases Charisse's Baby, You Knock Me Out number, while the second offers up Kelly's I Like Myself. Two classic cartoons, the Tex Avery Deputy Droopy and Hanna-Barbera's Christmas-themed Good Will to Men (a remake of the 1930s cartoon Peace on Earth, but replacing the chipmunks with mice), are both in superior condition. It's always a treat to see outtakes from classic musicals, even if they're not really up to snuff, and the deleted material from It's Always Fair Weather was well left on the cutting room floor. Jack and the Space Giants lets Michael Kidd do a choreographed Iron Chef impersonation, as he frantically navigates the kitchen to prepare a feast for his three kids, while Love Is Nothing But a Racket gives us the Kelly-Charisse pairing we missed in the film. The latter number affords the duo a chance to clown around, and though the lowbrow tenor of the piece suits Kelly, it makes Charisse�who built a career epitomizing style and grace�often look like a clod as she tries to hoof and mug in a variety of guises. Still, it's fun to see the pair share the stage, even if most of the time they bafflingly dance alone. The Binge offers a couple of brief deleted segments from a number already included in the film, and the audio-only outtake, I Thought They'd Never Leave, showcases the mellifluous voice of Dolores Gray. Despite the lack of visuals, the song eclipses the other deleted segments, thanks to Gray's smooth, seductive delivery. The movie's original theatrical trailer ties up the extras package. Though its title promises sunny skies, It's Always Fair Weather is, at times, pretty gloomy. A sober, cynical story dims this musical's bright outlook, despite a handful of memorable numbers and some biting satire from Comden and Green. Warner provides a stellar widescreen transfer and remastered audio, but only the musical faithful will be inclined to purchase this promising but disappointing film.